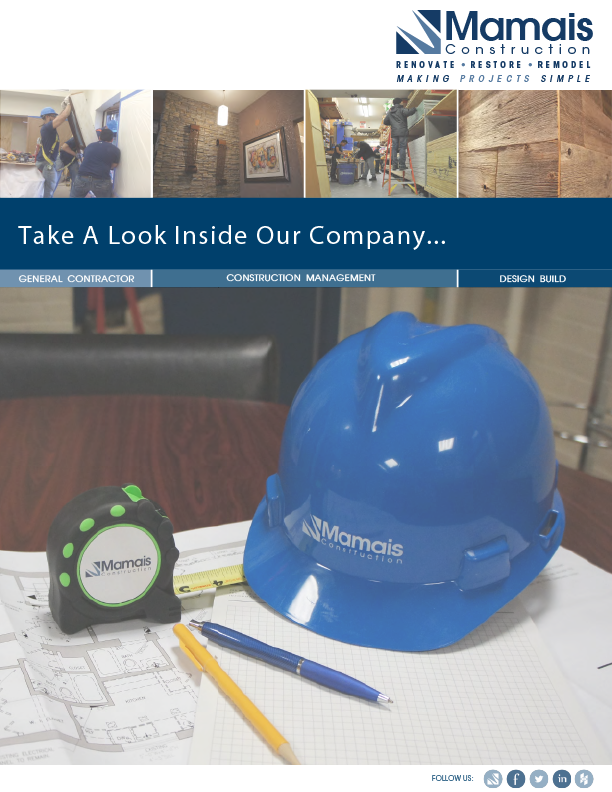 Our leadership team at Mamais Construction is comprised of experienced professionals representing the various disciplines of the construction industry. While they provide direction to ensure our sustainability and growth, we recognize much of our long-term success is also attributed to the talent we’ve attracted throughout our organization and the passion, knowledge and skills of these quality individuals. Working together, we deliver on our promise to be the best at what we do – in the office and on the jobsite. As President, Voula leads the strategic growth and financial operations of Mamais Construction. With over 26 years of business and managerial experience, she is responsible for leading the company’s business development and marketing efforts, and managing client relationships. Voula believes that the relationships formed with clients and vendors directly impact the success of the company and because of this, places a significant value on the development and maintenance of these relationships. Her leadership, ingenuity and tireless work ethic contribute to the company’s renowned dependable reputation. Peter has 25 years of construction industry experience and a comprehensive background in construction operations, cost accounting, estimating and project management. He oversees all project management and field supervisory staff members, and is instrumental in shaping the business structure and culture that support the company’s success. As Vice President, Peter has played an essential role in the company’s growth over its successful history. He believes that the success of a company is directly related to the quality of its staff, and as such continually reinvests in the company to maintain a highly qualified and knowledgeable professional team. Lawson directs the Construction Services team and brings a unique approach having previously worked for architects, developers and property managers. This experience provides an in-depth understanding of the expectations for all project stakeholders and allows Mamais Construction to maximize their services and responsiveness to client needs. With 15 years of experience in construction and architectural design, Lawson includes project procurement, estimating, project requirements, design coordination and project development in his duties to assure client satisfaction and success with every project. As Construction Operations Manager, Chris oversees on a daily basis the Project Management team responsible for general conditions, scope verification, and quality control with an emphasis on site safety management to coordinate the execution of our projects. He is actively involved in coordinating all pre-construction activities including scope review, condition surveys and scheduling. With more than 18 years managing construction projects, Chris specializes in delivering projects of all sizes and scopes, on time and on budget. Using his experience and expert knowledge of the construction industry he ensures the project management team meet and exceed company goals and customer satisfaction. The Procurement Manager (PM) is responsible for developing and managing all aspects of the project controls effort including percentage of completion, billing, purchasing, coordinating, financial monitoring, financial analysis, and financial reporting. The PM collects, organizes and reports on actual versus budgeted project costs. With 6 years of experience in Procurement Management, Jenn contributes to the importance of managing each phase of our projects cost effectively and timely. The PM facilitates communications with the Project Managers to effectively track the progress of projects and prepare status reports for management to analyze on a recurring basis. The PM also identifies schedule slippages and budget overages and works with management to develop a corrective action. Julie manages the day to day operations of the office. The Office Operations Manager is responsible for organizing and coordinating office operations and procedures in order to ensure organizational effectiveness and efficiency. Her role includes supervision of the accounts payable, accounts receivable, payroll, human resources, and administration departments. This includes managing the company insurance programs and employee benefits. With more than 16 years of experience in office management, Julie is also responsible for completing pre-qualification packages for customers to ensure compliance with corporate policies. Karen manages our marketing & business development efforts and is responsible for supporting and executing the company’s marketing and communication strategies. These responsibilities include the development and maintenance of our marketing material in support of our business development team. Additionally, she qualifies leads to be used for marketing campaigns understanding this information is invaluable as we plan our business and marketing strategies for the future. With 5 years of experience and a passion for marketing and business development, Karen contributes to the importance strengthening our relationships with our clients and keeping our marketing in line with our field efforts. As our Safety & Compliance Manager (SCM), Richard directs and manages compliance with the company’s safety program and project accident prevention efforts to ensure safety goals are met. The primary responsibilities of the SCM include monitoring work activities to ensure a safe system of work is executed, the required precautions are implemented, all PPE tools/equipment and related work practices are followed, as well as, ensuring compliance on all company standards and protocols to maintain organizational efficiency. With 5 years of experience in Safety & Compliance Management, Richard continually reviews and adjust work procedures as may be required to ensure the safety of all employees and the general public. He confirms all observations are documented, reported, filed and communicated where required. These efforts are meant to reduce risk and inefficiencies throughout our projects.